filed: March 29, 2012 • California, Opinions, U.S. In the first part of this wind industry cover-up story, it was pointed out how California Condors were trapped from the wild in the mid 1980s as an emergency response to save the quickly disappearing population from thousands of turbines that had been placed in the Tehachapi Pass region. In the 1980s as the turbine numbers and size expanded, wind personnel began seeing increasing numbers bird carcasses around the turbines. Due to the severity of the avian mortality problem, the wind industry adopted a strategy for survival; whatever happens on a wind farm, must stay on the wind farm. They knew that without a witnesses or bodies it is tough to prove anything. So with their on site high security, gag orders in lease contracts and workers fearful of losing their jobs, it helped them to maintain this concealment. But there still were some lose ends. In 1985, the same year the 10 -13 missing condors came to light, a bird mortality study at the San Gorgonio pass wind turbines was being conducted by a competent ornithologist named Michael D. McCrary. In 1986 he came forward with his results. From his research he estimated that 6,800 birds were being killed annually by the 2947 turbines in this wind resource area. He also discovered that virtually all of the fatalities were smaller birds and that the turbines were killing nocturnal migrants. These were astounding numbers and his report should have been an immediate red flag for the California Department of Fish and Game (DFG), the U.S. Fish and Wildlife Service (USFWS) and the California Energy Commission (CEC). The McCrary study should have prompted immediate follow-up studies at the three major wind resource areas in California about the impacts of the propeller style wind turbine. These wind resource areas were Altamont Pass, Tehachapi Pass and the San Gorgonio pass. Instead the opposite took place. The research and study of the impacts from wind turbines came to a stand still. Then in 1988 the California Energy Commission stepped in and funded a study to examine the extent of avian mortality at the three major wind resource areas in California. Even though the wind projects were being conducted with secrecy on private land, the public was becoming aware of the wind turbine impacts. Concern was building because word was coming in from the field about dead eagles and raptors with horrific injuries were showing up in wildlife rehab centers. This new study was an attempt to “document the reported” losses at each wind farm from November 1984 until April 1988. A period of 3-1/2 years. 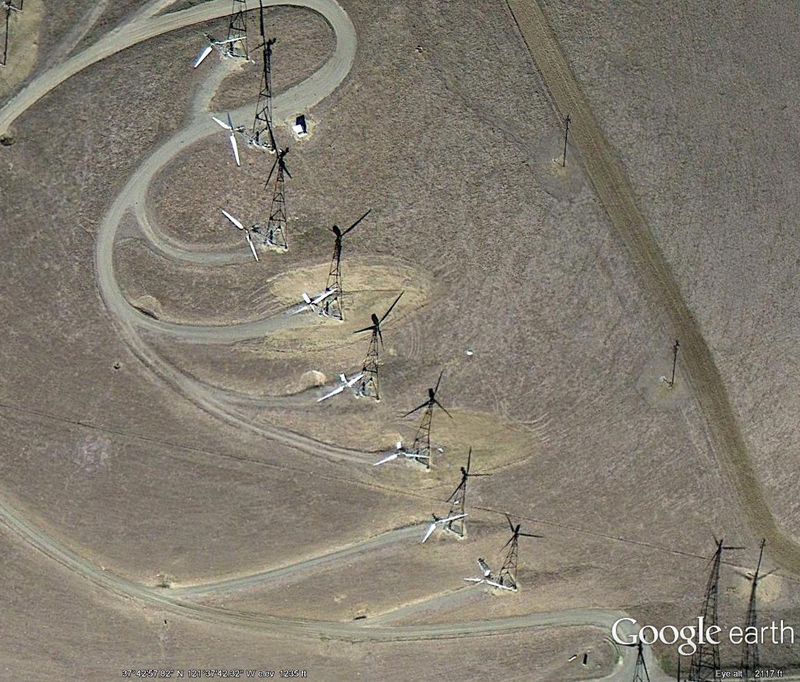 It was titled “Avian mortality at large wind energy facilities in California: identification of a problem”. The McCrary study had already reported several years earlier that approximately 2.3 fatalities were occurring at each turbine per year or approximately 34.4 per MW at San Gorgonio pass wind turbines. Keeping those numbers in mind and using these same ratios for all of California, gives us a mortality figure of 34,000 mortalities for the 15,000 turbines in 1988 and 19,550 for the 8500 turbines in 1984. When the other year and a half is added to the total and adjusted for the changing turbine numbers, you would get approximately 40,000 additional fatalities. By using the McCrary figures, there would be an estimated total of 93,950 avian fatalities for California from November 1984 up through April 1988. At that time the wind industry knew they could never survive these fatality numbers because the public would not stand for it. So the 1989 California Energy Commission report, in an attempt to rewrite history, came to some startling conclusions and opinions about the fatalities at the three major wind recourse areas from 1984 to 1988. They claimed that “the purpose of the study was to document avian collision and electrocution incidents at wind energy facilities.” But it really wasn’t a study at all. It was nothing but a list of the wandering wounded raptors of documented incidents that had escaped the secrecy of California wind farms. These were the only incidents that could be proven by the outside world regarding what was happening around the turbines. This study would mark the beginning of a new era of deception for the wind industry, the California Energy Commission and Government Wildlife agencies. Their study revealed 72 incidents of avian fatalities involving wind generators and associated powerlines over a 3-1/2 year time period. Power lines were even given a portion of the blame in these 72 fatalities. Topping it off, all collision incidents occurred at only two of the wind resource areas in California,nothing was reported from San Gorgonio. Tens of thousands of birds and raptors had been killed by these new wind farms and this document was the best the CEC, the USFWS, and CA DFG could come up with. Looking back anyone should be able to see that the obvious purpose of this study was not to document avian collisions at wind farms, but was to say as little as possible about this problem. In my opinion this 1989 study, report or what ever you want to call it, is mother lode of all bogus wind documents. Even sadder, is the fact that the figures produced by this document have been quoted in deceptive studies and reports promoting the wind industry for over 20 years. The reality was that since 1984, eagles and other protected species were being slaughtered like never before in America. It was as if the Migratory bird treaty and the laws pertaining to the “take” of protected species had never been written. If they wanted, the USFWS and DFG could have pulled the trigger on this industry any time they wanted. It did not matter a bit that any of this was on private property. With these agencies, if there is reason to believe wildlife violations are being committed, there are no fences. In a perfect world, none of these the agencies would have dismissed the McCrary study. Anytime they wanted to document what was really happening at the wind resource areas, they would have went to each of the wind farms to look for themselves. Then they would interviewed the hundreds of workers and security personnel that witnessed the bodies piling up. For workers, it would have been easy to see dead birds lying in the clearings around installed wind turbines. Workers and security driving around on the service roads that feed into every turbine (see images), would have seen plenty because large birds can be seen from several hundred yards away. Workers would have also been witness to the fact that these turbines were knocking down all types of birds. Not just raptors. The USFWS, and CA DFG should have then demanded real studies. But they didn’t. Instead they did what they are still doing for this industry. The upper levels of these agencies helped the wind industry cover up this problem. They did this by taking no action by not initiating any proper studies. However they did do something, they wrote a letter. As we all know, that letter did nothing for the ongoing carnage. For the wind industry what the McCrary study really proved was that what happens at Altamont Pass is not unique. 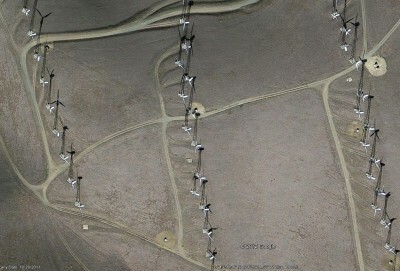 Everywhere birds are mixed with the propeller style wind turbines, they get slaughtered. But unlike Altamont where studies from 1998-2004 estimated mortality as high as 2,277 raptors and 11,520 birds killed each year, the McCrary studies not only showed higher numbers but also showed a much higher percentage of small birds being killed. I have looked over all the studies produced from Altamont and all have serious flaws. If the true numbers of small birds being killed were added to the mortality reported from Altamont pass, there would be at least 2-3 times more fatalities. In other words at least 25,000 birds per year. One of the primary reasons for the flawed mortalities figures coming out of Altamont is a result of the studies being conducted on 30-90 day cycles. These studies are missing most of the smaller birds and bats. To find these smaller species, mortality searches must be conducted on a daily basis to keep up with the multitude of ravens, gulls, and mammals that are eating them. Conducting searches on a daily basis will also serve another useful function. It would keep researchers ahead of the worst scavengers of all, wind industry personnel. Security and maintenance workers would then not be able pick up the bodies of highly sensitive species. Important rare species like peregrine falcons, white-tailed kites, condors, and whooping cranes, could then be reported instead of hidden. If anyone thinks that this is not going on within the secure boundaries of wind farms, then consider these facts. The only peregrine falcon ever found killed and reported at Altamont Pass was during a mortality study being conducted on a 2 day search cycle. This same study also recorded the highest mortality ever for Altamont Pass because researchers were getting to more of the smaller birds. It is also my belief from my research, that theMcCrary 1986 study from San Gorgonio Pass study has never been given to Congress by the California Energy Commission when many other worthless wind industry studies have. Yes, the industry today now admits to more fatalities at 2.9 per MW but this is still 12 times less than the 34.34 fatalities per MW reported in 1986 by McCrary. The low 2.9 per MW figures have been deliberately cooked up by the industry. It has been done by using industry approved grossly undersized search areas and studies that do not look for fatalities on 1 day search cycles. They also do not use trained dogs because with trained dogs far more birds and bats would be found in a fraction of the time. The industry is well aware of all of this. Today there are USFWS voluntary guidelines currently in place for the wind industry and they have been there all along. From the very beginning this industry has never been required to say or report anything of substance. As anyone can see from the information I have presented in this report, this is what you get with volunteer guidelines. We are lied to. Today all the same problems that existed in the 1980’s, are still with us. The industry still continues to operate their wind farms like Area 51 in Nevada and they generate any of the needed paperwork to keep things that way. I can not bring back the millions of birds killed by this industry. I can not undo what has already been done. But I can educate people to this very real and growing problem. Millions of birds being killed by this expanding industry and it is going to get a lot worse. This is not a problem about English Sparrows and Starlings; it is about hundreds of other species that need the habitats where these turbines are being placed. They can not coexist with these turbines and never will. My intention with this report is for the public to understand the path this industry has always taken. Then by using this knowledge the necessary changes can be facilitated. If nothing is done, the rapid expansion of the wind industry will absolutely bring about the extinction of several bird species and forever change the remaining bird populations on this planet. Society can not wait for the wind industry to come clean and move away from their propeller style wind turbine. It may never happen. But the public can force this to happen with enough support. A good place start would be for some ethical USFWS mandatory guidelines and for the public to end the wind industry tax credits. Jim Wiegand is a wildlife biologist.